Hyperhidrosis, or excessive sweating, is a condition that effects 3% of the American population. It manifests as persistent, usually unprovoked sweating of the underarms, palms, soles or face. Those suffering from underarm sweating may have to change clothes often to avoid staining. Sweating of the palms interferes with handshaking and simple tasks such as holding a pen or a steering wheel. Foot sweating leads to chronic athlete’s foot and odor, and makes it difficult to wear sandals. Hyperhidrosis is usually embarrassing and debilitating as it complicates romantic, social and business interactions. With a stepwise approach to treatment, most patients with hyperhidrosis can achieve a lessening of symptoms and an increased quality of life. Options include topical antiperspirants, oral medications, botulinum toxin injections, and iontophoresis. The International Hyperhidrosis Society website is a great place to learn more about hyperhidrosis and connect with others who have the condition. 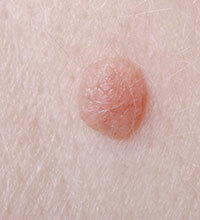 Cysts are benign sacs that appear within or just below the skin. They most likely occur from a blocked pore or hair follicle, though some are probably hereditary. Epidermoid (or sebaceous) cysts may appear anywhere on the body, while pilar cysts typically appear on the scalp. 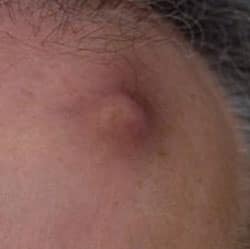 The cysts are filled with a foul-smelling material that may occasionally drain from an overlying pore. Cysts may remain stable in size or enlarge over time, but they usually do not resolve completely on their own. If they are not painful, itchy, rapidly growing, or unsightly, they are benign and do not need to be removed. If bothersome, small cysts may be drained and removed with a small tool, however larger ones may need to be surgically excised. If a cyst ruptures, it will become red, inflamed, swollen, and very painful. This may be the result of pressure, trauma to the area, or a bacterial infection in the cyst. In these cases, the cyst will most likely be anesthetized and drained, a simple procedure that brings immediate relief. Injected anti-inflammatories and oral antibiotics lead to quick resolution of symptoms.